IKO International is building on its standard MX series of linear roller bearings to include special features for environments that are sensitive to metal chips, dust, and other contaminants. Dust protection. A dust protective C-Wiper can be mounted to the outside of the end seal, ensuring operation in environments where metal chips are spattering. After 1,000 km of operation, the C-Wiper prevented foreign substances from entering the slide unit with no damage to the end seal. IKO International has expanded its line of CFKR series of Double Hex Hole Cam Followers. The outside diameter of the outer ring is now available in 22 and 26 mm, with current models as high as 90 mm. These bearings are designed for outer ring rotation and have superior rotational performance with a small coefficient of friction and high load capacity. Consider the CFKR 90 model, which features a dynamic load rating in excess of 45,000 N, compared to 40,500 N for similar cam followers on the market. IKO International now offers two different long-term lubrication technologies for cam followers: a self-lubricating solution for the cam follower itself, as well as an external mechanism that lubricates the bearing surfaces against the rail. 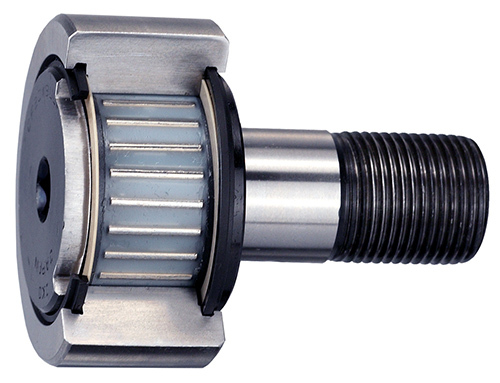 IKO’s line of C-Lube cam followers include a thermoset solid lubricant prepacked into the bearing space for long lasting, maintenance-free operation. Stud diameters are available from 5 to 20 mm. IKO International has expanded the number of carriage sizes and options available for its line of miniature bearings, making them the most robust on the market. IKO currently offers some of the smallest commercially available miniature bearings, with sizes as small as 1 mm. To handle more robust applications, the company offers standard and wide rail options to its C-Lube Linear Way ML line, suited for single-row track rail uses. IKO International's CRBF mounting hole type, crossed roller bearings are now available in shaft diameters from 10mm all the way up to 115mm. Space-saving design. These specialized bearings feature a space-saving design, with rollers alternately crossed at right angles between inseparable inner and outer rings. Because the rollers make inline contact with the raceway surfaces, elastic deformation under load is minimal. Bearings can simultaneously accommodate loads from all directions, including radial, axial and moment loads. IKO's C-Lube Linear Way ML/MLF is a ball style, rolling guide for use in linear motion applications requiring smooth travel and maintenance-free operation. The C-Lube lubricating element features a unique capillary system consisting of a porous resin sleeve and steel backing, formed by sintering fine resin powder and impregnating a large oil supply into its open pores. As the steel balls circulate within the slide unit, lubricant is continuously distributed to the balls and then the track rail as the bearing travels. IKO's MX series of linear roller bearings delivers a combination of extreme rigidity, high accuracy and smooth motion which are all required for demanding applications (such as machine tools, semiconductor manufacturing equipment and liquid crystal manufacturing equipment) or any other applications subject to shock, vibration or overhung loads. IKO's BWU high rigidity precision ball slide is a compact, linear motion rolling guide ideally suited to applications with limited stroke length. The BWU unit incorporates two rows of steel balls in four-point contact with the raceways that deliver stability, accuracy and high rigidity even under fluctuating and complex loads. IKO International announces a new addition to its roller bearing family, CRBF Mounting Hole Type, High Rigidity, Crossed Roller Bearings. These specialized bearings feature a space-saving design, with rollers alternately crossed at right angles between inseparable inner and outer rings. Because the rollers make inline contact with raceway surfaces, elastic deformation under load is minimal. IKO International introduces the C-Lube Linear Way MLL, a ball style, rolling guide for use in linear motion applications requiring extra high rigidity, increased load capacity, smooth travel and maintenance-free operation. IKO International introduces the C-Lube Linear Roller Way MXL, a roller style linear guide for use in applications requiring extra high rigidity, increased load capacity, superior accuracy and maintenance-free operation. The MXL style - extra high rigidity long - is part of IKO's C-Lube Linear Roller Way Super MX family, which features a range of load capacities and mounting configurations. High carbon steel slide units and track rails may be ordered separately and assembled to make a set as required. MXL units are suited for a host of applications requiring maximum rigidity, from improving machine tool cutting accuracy to semiconductor and liquid crystal manufacturing. IKO International introduces the CRWG Anti-Creep Cage Crossed Roller Way, a linear motion rolling guide for use in applications where cage creep is an issue. The CRWG features a novel design in which the built-in rack and pinion mechanism eliminates cage creep, resulting in highly accurate and smooth linear motion. IKO Standard Type Cam Followers (CF) are follower needle bearings for cam mechanisms that provide both high accuracy and high rigidity in linear motion applications. Widely used in machine tools, industrial robots, electronic devices, and office automation equipment, Hex Head cam followers come in a variety of styles and can be installed firmly and easily using a hexagonal wrench. Sizes include stud diameters from 3 to 30 mm. For styles that require periodic maintenance, a relubrication root can be selected from three positions for ease of service. The IKO Precision Linear Slide BSP/BSPG/BSR is a lightweight and compact rolling guide for demanding linear motion applications, suitable for use in measuring equipment, disk drives, integrated circuit (IC) manufacturing, inspection devices, and clean room environments. The slide consists of a U-shaped table (slide unit race) and bed (track rail) available in a wide range of sizes. IKO has launched the C-Lube Unit to reduce cam follower maintenance time and costs, which represents a significant expense over the lifetime of the bearing in a typical plant environment. Unlike anything available in the industry today, IKO's C-Lube Unit contains a solid lubricant which is automatically distributed onto the cam follower's outer ring and then onto the mating track surface to provide abrasion protection and increase corrosion resistance. This negates the need for periodic oil supplying, which can be labor intensive, especially across multiple cam followers.